Illinois governor Rod Blagojevich’s surprise appointment yesterday of Roland Burris to the Senate seat vacated by Barack Obama has received uniformly negative reviews. No one, it seems, is content to let this appointment stand. The conventional wisdom is that Blagojevich’s arrest for trying to sell the open Senate seat means that any appointment by Blagojevich is illegitimate. Admittedly, everyone is outraged—or wants to be seen as outraged—at Blagojevich’s apparent corruption. The legal or logical case against the appointment, however, is just short of nonexistent. Has Blagojevitch lost his moral authority to govern? As one famous politician might say, you betcha. Nonetheless, Blagojevitch is still innocent until proven guilty, and there has been no trial. To my knowledge, no Illinois statute requires the governor to relinquish his power upon arrest or indictment. Like it or not, Blagojevich is still the governor and has every legal right to appoint Burris. Whether he has the moral right is somewhat beside the point. Various legal moves might be able to delay Burris’s taking a Senate seat, but I don’t see that any person or body has the legal right to undo the appointment. Now that politicians have had their opportunity to establish their ethical credentials by denouncing the Senate appointment, it is time for everyone—Democrats, anyway—to recognize that the governor has done them a big favor. The appointment creates a win-win situation. Blagojevitch, by appointing a seemingly qualified person with no connection to the appointment-selling controversy, enhances the credibility of his otherwise dubious claim of innocence. Illinois gets the representation in the Senate to which it is entitled. The Democrats get a much-needed additional vote in that body, not to mention a rare black face among a sea of white ones. And all our lawmakers can get back to the more important business of saving us from Great Depression II. On the negative side, of course, the Republicans lose an issue if the Burris appointment stands. They will, I predict, find others. Illinois legislators may feel compelled to move forward with impeachment proceedings against the governor. One can make a case for the appropriateness of doing so, though even impeachment will not undo whatever actions Blagojevich has taken as governor before he might be removed from office. As far as the Senate appointment itself goes, however, my recommendation is that everyone just let it be. 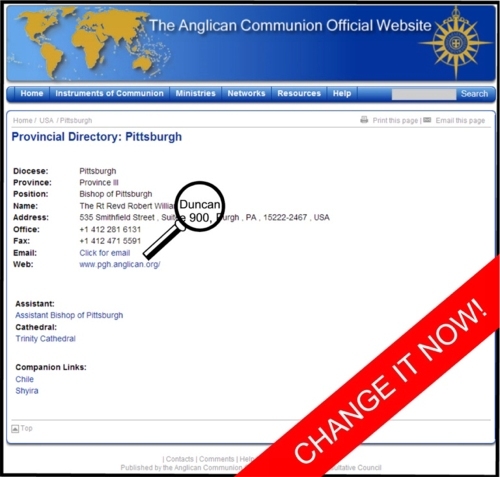 I was distressed that, even after Bishop Duncan was deposed, the convention of the Diocese of Pittsburgh voted to “realign,” and Presiding Bishop Katharine Jefferts Schori acknowledged new leadership in the continuing diocese of The Episcopal Church, the official Anglican Communion Web site’s page about the Diocese of Pittsburgh did not change. I wrote to the Anglican Communion Office about the page, and I was reassured that The Episcopal Church had requested changes as well. When I checked today, however, more than three months after Bob Duncan was deposed and two-and-a-half months after Duncan’s supporters voted to leave The Episcopal Church, the Anglican Communion page on the Diocese of Pittsburgh is unchanged. I find it distressing that your page about the Episcopal Diocese of Pittsburgh (http://www.anglicancommunion.org/tour/diocese.cfm?Idind=686&view=alpha) still lists Robert Duncan as bishop and Henry Scriven as assistant bishop. It also lists the wrong address, the wrong telephone numbers, and the wrong URL for the Web site (which, as it turns out, is redirected to the proper site). Bishop Duncan was deposed by The Episcopal Church in September, and his followers voted to “join” the Southern Cone in October. Presiding Bishop Katharine Jefferts Schori, a few days later, recognized a diocese quite distinct from the “diocese” you list on the official Anglican Communion Web site. The Anglican Communion Office has had ample time to correct this page. I and others have tried to get the page changed to no avail. More than two months after Bob Duncan led members of the diocese out of The Episcopal Church, the Anglican Communion Web site still does not recognize the real Diocese of Pittsburgh. After this much time, one begins to wonder if the failure to update the page is deliberate. Surely, this failure is yet another indignity visited upon The Episcopal Church by an Anglican Communion obsessed with appeasing whoever whines the loudest. Your “Diocese of Pittsburgh” page can only encourage Bob Duncan and his schismatic followers. The Communion will not be better for it. I will follow up with e-mail messages to selected people listed on the Contacts page as well. Perhaps some messages to people at the Episcopal Church Center would also be in order. As it happens, the pages for the Dioceses of Fort Worth and Quincy are also unchanged, though the San Joaquin page does seem to be up-to-date. I’m not sure how long it took for the San Joaquin page to be changed; perhaps I have unrealistic expectations of what business-as-usual looks like at the Anglican Communion Office. Or perhaps the Communion should spend a bit less money on travel and report writing and a bit more on actually communicating facts to Anglicans around the world. I hope that I didn’t lead any readers to think I was going to cover the Episcopal Diocese of Pittsburgh’s special convention in anything like real time. I did not anticipate that anything unexpected was going to happen, which made prompt reporting seem unnecessary. Of course, Standing Committee president Jim Simons did announce that retired Western North Carolina bishop Robert H. Johnson was going to be a half-time assisting bishop in the diocese through July 2009. Simons did not say what the diocese will do for a bishop after that, but, presumably, that will depend on how things go in the coming months. A press release from the diocese about Bishop Johnson can be read on the diocese’s Web site. I don’t know much more about him than is available there. Louie Crew has some facts about the bishop and his voting record here. You can make of that what you will. General coverage of the convention was done by the Pittsburgh Post-Gazette and Pittsburgh Tribune-Review. For me, the highlight of the convention was Simons’ State of the Diocese address. This turned out to be something different from what the title suggested. I expected facts, such as how many parishes were in the diocese and how many may soon join. Instead, Simons essentially said that it is time to stop fighting and time to start building. What was surprising was that he accepted some personal responsibility for the creation of what he called “a culture of fear and control” under Bishop Duncan. (The deposed bishop was not mentioned by name.) As one who has fought against that culture for the past five years, it was gratifying to hear a repudiation of it from someone who enabled its development. Openness and coöperation were evident in both obvious and subtle ways at the convention. Individual parishes were assigned the task of providing refreshments at various points in the program, and attendees were fed well. Six parishes provided singers for the combined choir of about 50 that sang at the closing Eucharist. In the past, only official “mission partners” of the diocese could have displays. Progressive Episcopalians of Pittsburgh, for example, has never been able to have a sanctioned role in a diocesan convention. But displays from PEP, Integrity Pittsburgh, the Calvary Church Bookstore, and a Ugandan orphanage were all in evidence at the special convention. PEP distributed perhaps 100 of its “The Episcopal Church Welcomes All” buttons. That the diocese is getting better at staying in conversation was obvious from the discussion of the four resolutions proposed to facilitate the diocese’s reorganization. All of these were passed with virtually no discussion and no dissenting votes, a far cry from the acrimonious debate of recent conventions. Of course, the resolutions had been distributed in advance of the convention, and people had opportunities to express concerns about them. In the past, those favoring or opposing any particular resolution would consult in advance of the convention with allies, strategizing how to strengthen or weaken a resolution and planning how to carry on a floor fight. The draft of Resolution IV for the special convention did raise some concerns. It was intended to declare constitutional and canonical changes made under Bishop Duncan null and void, but there were disagreements over how wide-ranging the resolution should be and how the intended actions should be justified. The underlying problem, of course, was that some of the people who needed to declare past changes improper had supported them enthusiastically. The resolution went through three official rewrites, and the version presented to the convention was the product of a process that sought to listen to and address the concerns of everyone. No one voted against Resolution IV; it attracted a single abstention. Many people remarked to me how different and friendly the atmosphere seemed. The tenseness of recent conventions was not in evidence. When things went wrong—some errors were made in tabulating votes for Board of Trustees positions, for example—everyone seemed to take it in stride. In past years, the closing Eucharist has been notable for the number of people who left the convention before it began. It seemed that many fewer people made an early getaway this time. The service was crowded. Because St. Paul’s curate, Kris Opat, was being ordained, some worshippers came especially for that service, of course. In any case, the service and the reception that followed were very happy affairs. Jim Simons’ address was, of course, a challenge. There will be disagreements among the people of the diocese in the future, and it remains to be seen whether we can change what had become a dysfunctional culture. There is surely hard work ahead of us, but I think we’re off to a good start. POSTSCRIPT: Because so many diocesan leaders had left the diocese for the Southern Cone, many diocesan positions had to be filled by election at the special convention. I spent a lot of time thinking about how I could best serve the diocese and to what position I might reasonably expect to be elected. (My résumé didn’t make me look like a strong candidate for Board of Trustees, for example.) I finally decided to run for the single lay seat open on the Committee on Canons, since I have spent much time contemplating and writing about the constitutions and canons of both The Episcopal Church and the Episcopal Diocese of Pittsburgh over the past several years. I ran and won against four other candidates. I am grateful for the confidence in me shown by the convention. I have no illusions about the difficulty of the work I have agreed to take on, however. Jim Simons’ challenge to reform diocesan culture will need to be kept in mind both in how my new committee works and in what it actually accomplishes. I returned from Evening Prayer and a lovely reception a little while ago. So far, the diocesan convention seems well-planned and well-executed. Unfortunately, the weather was not particularly coöperative tonight, and a light snowfall and slippery roads no doubt kept attendance down. The crowd was not embarrassing, however. A number of special guests made people feel like others cared for us in the diocese and were cheering us on. Bishop Paul Marshall attended from the Diocese of Bethlehem, as did Nathan Baxter from the Diocese of Central Pennsylvania, and Bishop Sean Rowe of the Diocese of Northwestern Pennsylvania, my previous diocese before I came to Pittsburgh. Bishop Bob Ihloff, Province III president, was unable to be present, but he sent a letter and communicated greetings from all the Province III bishops. (The Rev. Barbara Saras, coördinator of Province III was on hand and had set up a table with materials about the province.) Of course our consultant, Bishop David Jones was present from the Diocese of Virginia, as was the Ven. Richard Cluett, who was recently named by the Presiding Bishop as pastoral assistant for reorganizing dioceses. On the eccumenical front, the Rev. Kurt Kusserow, ELCA bishop of Southwestern Pennylvania Synod was there, as was the Rev. Don Green, executive director of Christian Assoicates of Southwest Pennsylvania. The business part of the convention starts early tomorrow. Time for bed … . The special convention of the Episcopal Diocese of Pittsburgh (i.e., the diocese actually in The Episcopal Church) begins this evening with Evening Prayer and a reception. Tomorrow promises a busy morning of business and a joyous Eucharist and Ordination in the afternoon. It all happens at my parish of St. Paul’s, Mt. Lebanon. On Tuesday, I helped make final revisions to one of the four resolutions that will come before the convention. Resolution IV has now been through four official versions. Its purpose is to declare that certain changes to the constitution and canons made over the last five years were beyond the power of the convention to enact and were therefore null and void. I had expected that taking care of this piece of bookkeeping—essentially, getting rid of the changes that Bishop Duncan and his supporters claimed allowed them to “realign”—would be straightforward, but there were disagreements about just what provisions were improper, as well as how the justification for consigning them to the trash bin should be explained. The resolution to be presented tomorrow will restore the accession clause of the diocesan constitution to what it was before the 2003 annual convention, and it will eliminate the recently passed canon that declares the diocese to be part of the Southern Cone. I hope that all parties with serious concerns about the resolution are now on board, and no real debate will be necessary tomorrow. The final version of the resolution can be found on the diocesan Web site. My second convention-related task this week was getting out an issue of PEPtalk, the PEP newsletter. This December 2008 issue is short and designed mainly to show the flag at the convention. It reviews recent events—it has been a busy fall—and looks to the future. Interested readers can read the new edition on-line. Finally, I worked on the preparation of materials for PEP’s table at the convention, and I spent time at church this afternoon arranging the table itself. What is exciting about this effort is that this convention is the first one at which PEP (and other organizations that were not “mission partners” of Bishop Duncan’s diocese) could participate in a convention in any authorized capacity. Among the groups represented at tables at this convention are PEP, the Calvary Church bookstore, Episcopal Women’s History Project, and Integrity. This is a new day in Pittsburgh. Over the past few days, a number of people have volunteered to me that they are looking forward to this weekend’s convention. That is surely a change from past years, when most of the Episcopalians I know anticipated diocesan conventions with fear and loathing. The diocese has encouraged observers to attend, and I hope that we can fill the house. An often-visited page on Lionel Deimel’s Farrago is “Silent Ls.” There are, it turns out, a significant number of English words that contain Ls that are not voiced, and my page is intended to draw attention to them. The pronunciation of some of these words is uncontroversial; I have never heard anyone pronounce the L in “would,” for example. Other words may be pronounced with or without an L sound, and the pronunciation with a voiced L may even be more common. One such word is “falcon,” which I pronounce with an L sound. I find it maddening to hear common words that have traditionally had silent Ls pronounced with a voiced L. Newscasters, even those at NPR, are regularly guilty of this. The most common mispronunciations seems to be of “calm” and “qualm.” I think this comes of reading too much and listening too little. It was particularly disheartening this morning to hear NPR’s Cokie Roberts pronounce “balk” as one would normally pronounce “bulk,” or something very close to that, in any case. These are distinct verbs with very different meanings, however, and they are definitely not homonyms. Seemingly, Cokie said, “The Senate Republicans are bulking, and they have the support of the public in the bulking.” This conjured up an image of Senate Republicans getting bigger and bigger. You can hear it for yourself here.